uch has been written about Ben Corday lately and rightly so. He was one of the greats in the tattoo world and thanks to Hardy Marks’ new publication Tattoo Travel Book– Ben Corday,we now have a record of his painting skills comprised of beautifully drawn and shaded designs that were, as D.E. Hardy put it, “a primary influence on early twentieth century tattooing. The Tattoo Travel Book gave us some background information on Corday. We are now able to add to the Corday story thanks to Carmen Nyssen, a researcher in Washington State who has diligently researched Corday for the Bert Grimm book she is working on. Corday was a bit of a storyteller and as we know, news accounts have to be taken with a grain of salt. But, historical records show that Corday was born in Lancashire, England although he often stated that he was born in Hong Kong or Singapore. And to confuse matters more, his death certificate lists his place of birth as Lucknow, India! Through city directories and genealogy research Carmen has uncovered a wealth of information that lists Ben Corday’s long list of occupations as sailor, tattooist, giant and strongman in the side show; he served in the British Army, worked as wrestler, doorman, footman for a private family, stage and screen actor, commercial artist, engraver and stevedore. Ben Corday’s brother–in-law, George Dolling, also worked as a giant in the show business world. One of my favorite old time tattoo photographs is the D.E. Warford back piece by Corday with a cowgirl on horseback framed with American flags. This is a classic piece of Americana, sometimes referred to as the Annie Oakly back piece. Imagine my surprise when at a local postcard show I stumbled across "The Belle Of The Plane." 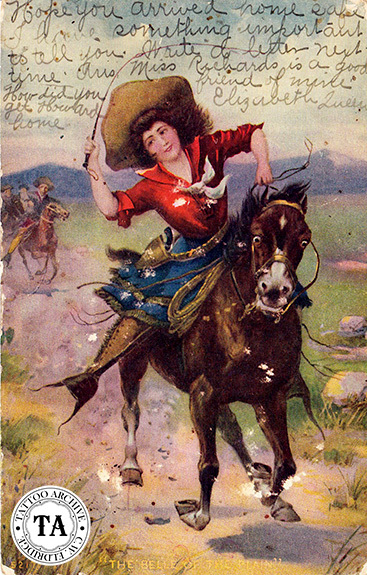 At first glance it reminded me of the Corday piece but when I was able to compare it to the Warford photograph, I realized that The Belle Of The Plain looks to have been the inspiration for Corday's Annie Oakley back piece. If you look at the position of the horses' legs and head, they are identical on both, but the cowgirl is different. This card is postmarked March, 27th 1907.